There's something dramatic and unsettling about seeing a photograph of more than six tons of elephant ivory set ablaze or otherwise destroyed: a stark reminder of the carnage of elephant poaching and the conservation crisis created by international trade in elephant ivory. But, each time a government destroys its ivory stockpile, as Ethiopia has now done this week, it sends a message to the world that ivory trade will not be tolerated - and that any chance of elephant ivory finding its way into illicit trade should be permanently removed. Born Free staff has witnessed the destruction of ivory in the US, Kenya, France, and now Ethiopia. I have personally witnessed the crushing of ton after ton of ivory in Denver, Colorado. And, I know that, if all governments were to destroy their ivory stockpiles, crack down on elephant poachers, and accept a uniform, unequivocal, global ban on elephant ivory trade, elephants in Africa and Asia would have their long-term viability secured. Born Free's recently-appointed Country Representative in Ethiopia, Zelealem Tefera, witnessed the ivory burn in person and called it "a landmark and vital step forward for wildlife conservation in Ethiopia." Zelealem hopes that this action will increase the momentum and raise the urgency of wildlife conservation in the country. Some countries insist on selling their stockpiles to trading partners such as Japan and China. Other countries want to reopen a commercial trade in ivory globally. But, those governments that want to see elephants protected in perpetuity and ensure that elephants have a future tend to oppose any resumption of ivory trade ... and go one step further. Across the US, state legislatures in Hawaii, California, Illinois, Massachusetts, and elsewhere are considering ivory bans. President Obama has convened an Advisory Council on Wildlife Trafficking. The US Fish and Wildlife Service is cracking down on both ivory trade and elephant trophies, specifically from Zimbabwe and Tanzania. The groundswell of movement across the country, and, indeed, across the globe, is to shut down ivory markets, permanently destroy ivory, and ensure that no ivory trade again threatens elephants and their future. Born Free's work in Ethiopia is incredibly important to me personally and to us organizationally. We are rescuing cheetahs from the pet trade, lions from zoos, and primates from restaurants, and we are putting much-needed resources into the field to conserve elephants where they belong: in the wild. 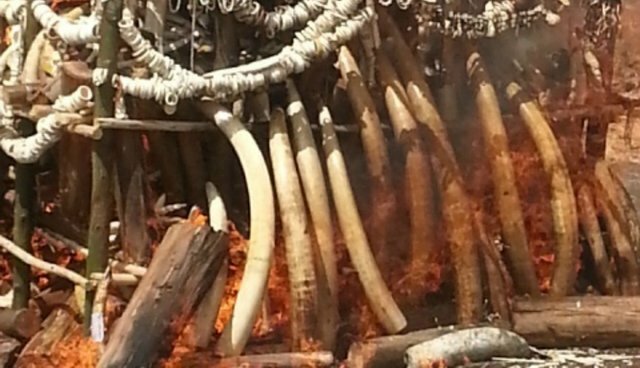 So, today, we should applaud Ethiopia's bold and historic ivory burn. Let's congratulate the Ethiopian government in its leadership role in saying "no" to elephant ivory.